Chattahoochee Riverkeeper is a member of EarthShare of Georgia, a federation of environmental organizations that provides a green choice in employee giving. EarthShare of Georgia can work with your business to initiate a charitable campaign that would be suitable for your office environment. For more information, please contact Becca Klein at bklein@chattahoochee.org or 404.352.9828, ext. 19. 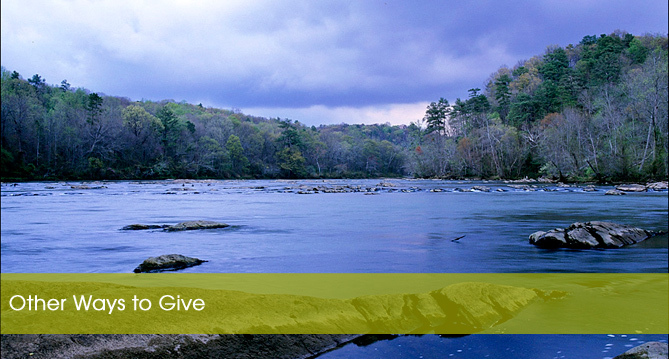 This is a relatively easy way to double your donation. Many companies offer to match whatever donation an employee gives to a charity. All you need to do is check with your human resources department to verify if your company offers a matching gift program. If they do, then get the required paperwork and enclose the form along with your personal gift when you mail it to CRK. CRK then processes the request on your behalf. Or, you may be asked to complete a form at the time you give your gift and your human resources department handles the request. Check with your company to see what protocols you should follow. Individuals may also want to consider donating stocks and/or bonds to CRK. Download our stock transfer instruction form, or contact Becca Klein at bklein@chattahoochee.org or 404.352.9828, ext. 19 with any questions. Amazon Smile is a website created by Amazon with the same products, prices, and shopping features as Amazon.com. The difference is that when you shop on smile.amazon.com, and choose Chattahoochee Riverkeeper as your charity of choice, the Amazon Smile Foundation will donate 0.5% of the purchase price of eligible products to CRK. Did you know you can support Chattahoochee Riverkeeper each time you shop at Kroger? All you need to do is sign up with your Kroger Plus Card here, and select Chattahoochee Riverkeeper for your organization to support. Once you’re enrolled, you’ll earn rewards for CRK every time you shop and use your Plus Card! Chattahoochee Riverkeeper's (CRK) mission is to advocate and secure the protection and stewardship of the Chattahoochee River, its tributaries and watershed, in order to restore and preserve their ecological health for the people and wildlife that depend on the river system.